Creative Common Search is a search portal that offers convenient access to search services provided by other independent search services. From this one site you can link to Google Images, Flickr, Fotopedia, Wikimedia Commons and other media sites. Do not assume that all images found on the independent sites will fall under CC license. This site requires registration for a free membership and contains over 400,000 free stock photos. Next to "usage rights" change the drop down menu to the appropriate license. For class purposes, this will likely be "free to use or share." This collection contains 16,797 free images available in a variety of commercial and editorial licenses, including public domain, creative commons, and custom agreements. Images and pictures are copyright protected. Do not assume that an image or a picture that you find on the Internet is free to use. When searching the Internet for images, the item you find may or may not have the copyright symbol or copyright details visible to you. 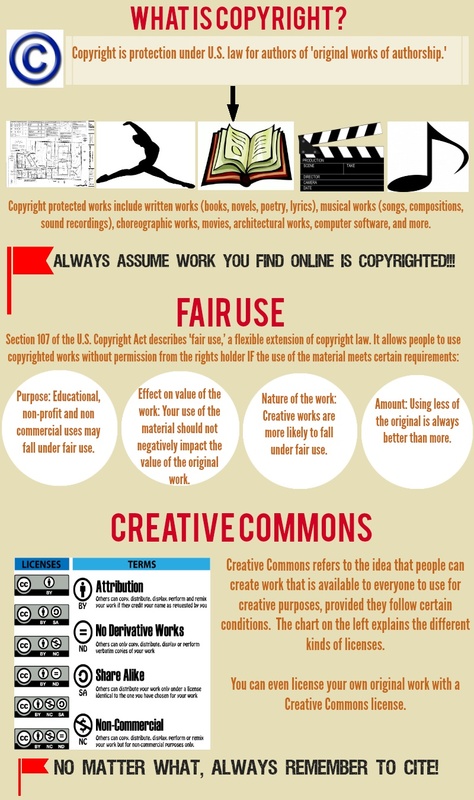 You may have to search the webpage for copyright information and instructions. You might ask permission of the artist to use the picture/image; however, you may not get an answer before you must submit your project. Don't forget to cite what you have permission to use. You must still check the picture/image and webpage carefully to ensure that the permission you are seeking is available. For example, you may be able to use it in a student project for class, but not post it to the Internet. Again, seek permission to use pictures/images. Don't forget to cite what you have permission to use. Consult the Permission Tab on this LibGuide.